Will-O-Wood Campground is a family oriented campground. 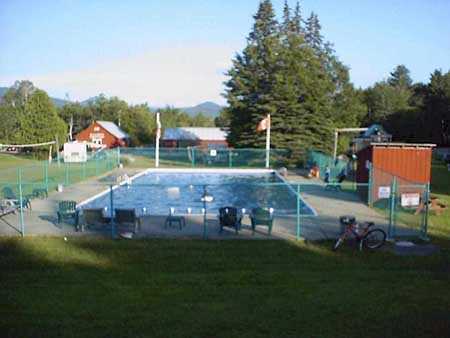 We offer a very clean and beautiful campground nestled amongst 100 acres of woods and fields of Vermont's Northeast Kingdom. There are many things to do on-site that include our spacious swimming pool with a toddler end, a basketball court, volley ball, horse-shoe pits, shuffleboard and a playground. The recreation hall is equipped with video games, a pool table, a ping-pong table, and game tables for cards, chess, checkers, and others. Nearby is Lake Willoughby which is a glacial lake with a sandy beach for swimming and an excelent boat ramp for fishing, sailing, water-skiing, and other water sports. There are two golf courses nearby: Orleans Country Club and Barton Golf courses. There are also courses in Newport and St. Johnsbury. We offer clean restrooms with hot showers, a well stocked general store for groceries, a complete line of RV supplies as well as other camping necessities. We also have a laundromat for your convenience.